Wales’s manager and former Manchester United ace Ryan Giggs appears ready to step away from the past for good after putting his £3.5 million mansion on the market. He bought the Manchester property during his relationship with ex-wife Stacey in 2004. And following their divorce,G iggs plans to move on from the relationship with PR girl Kate Greville, 34. The 45-year-old is moving out of his modern mansion in Worsley, which is complete with a grand entrance and winding staircase, indoor swimming pool and lavish gardens. When Ryan purchased the land 15 years ago he immediately demolished the property owned by the previous occupier and built the brick build which currently stands in the grounds. As soon as the new buyer walks into the home, they are met by an eye-catching entrance which centres around a sprawling staircase and boasts mood lighting and a table centerpiece. The lavish property features an indoor swimming pool, which is rectangular in shape and includes a Jacuzzi at one end of the light and airy room, as well as a seating area for those who just want to recline. Ryan’s kitchen is equally sleek and modern; the glossy black cupboards surround a stylish island which encases a hob and breakfast bar, while looking out onto the perfectly manicured gardens. Unsurprisingly in Ryan’s garden stand a set of goalposts, as well as a flag stoned patio area for BBQs and a quaint summer house which is situated on the lawn. 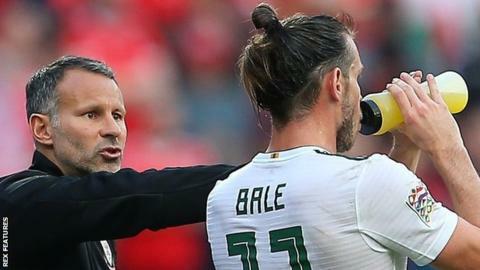 The Wales football manager’s ten-year marriage to Stacey was dissolved in 43 seconds in August 2017. They have two children together.